I don’t have a lot of room to store seasonal and holiday decor, so I went for a more simplistic route to decorate my apartment for fall. Mini pumpkins and gourds can be found at Trader Joe’s for an excellent price. So I scooped some up to tuck in here and there. I love the way they look against the vintage mason jars. And at the end of the season I won’t have to store the pumpkins and gourds. I’ll just throw them away. I tucked some in here and there on my blue hutch among the white dishes. I am beginning to love the “less is more” way of decorating. 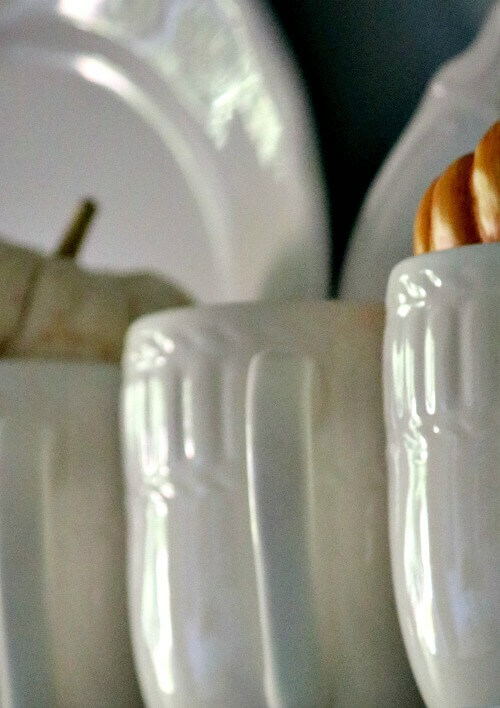 The white dishes are the perfect backdrop for fall gourds and mini pumpkins. In a small space h0me, you have to pick and choose a few optimum places to arrange your decor or it begins to look cluttered. 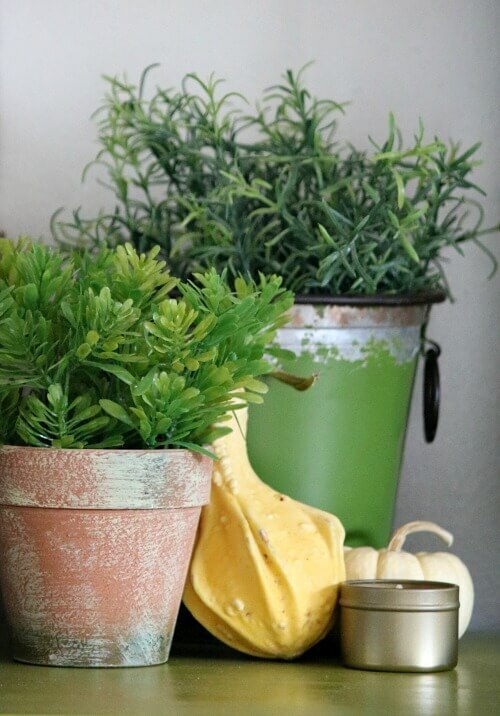 The idea is just to add some here and there to bring a touch of fall into your home. With this strategy you don’t have to go anywhere but the grocery store, local farmer’s market or your yard to find seasonal decor. If I had pine trees close by I’d be adding pine cones to the mix. Tuck some in around a candle vignette. This one is on my new dining room table. 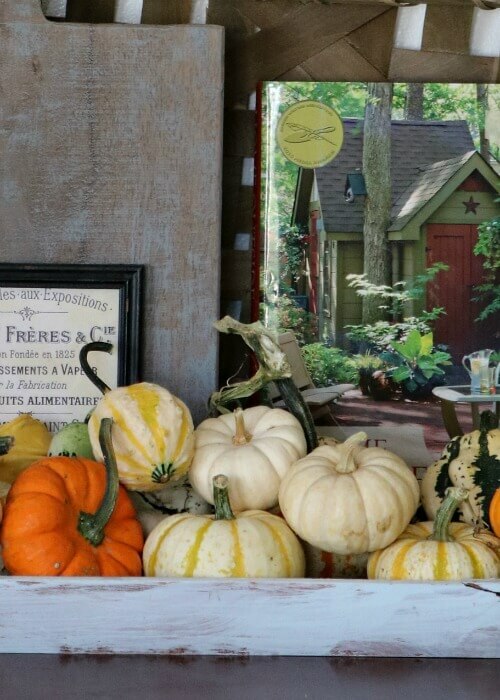 Add a couple of gourds or mini pumpkins to a vignette. It adds just a hint of the season without going overboard. This painting on my living room wall from Hobby Lobby always reminds me of fall with the tall brown grass. Just about every other week Hobby Lobby has their paintings on sale for 50% off. I like to pile mini pumpkins and gourds onto a tray or dough bowl. 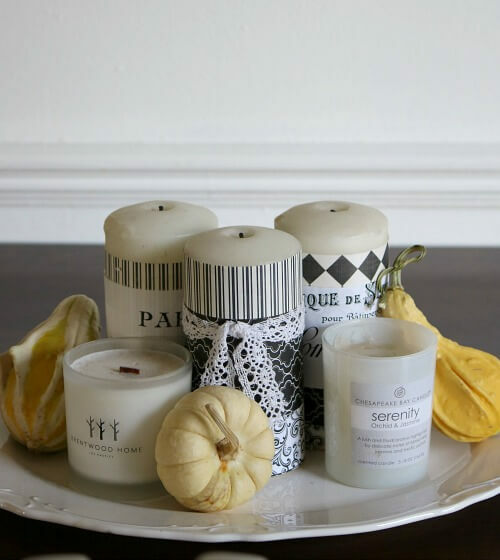 This is a very simple and understated way to bring fall into your home. After the fall season is over, this look will go right on into Thanksgiving. I haven’t decided what au naturel decor I’m going to decorate with for the Christmas holiday. But I’m looking for inspiration on Pinterest. If you have any ideas we can all incorporate into small space homes, please leave your suggestions in the comments. And here are Charlie and Ivy pics for the day. 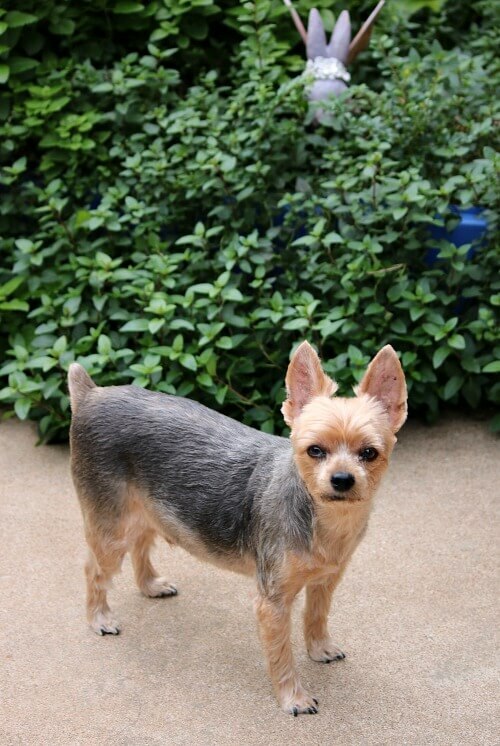 Charlie Ross is looking pretty spiffy after his hair cut yesterday. I got this photo of him when we went out on the patio this morning. 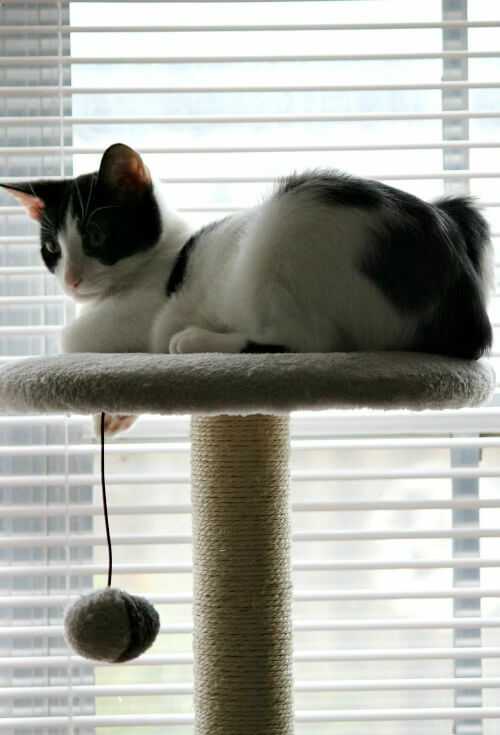 And here’s Ivy Lou on top of her cat tree. She loves to gaze out the window at the birds and squirrels from her high perch. Charlie looks handsome but not amused that you took his photo and Ivy is cute as ever. I need to check out Trader Joe’s as well for some mini pumpkins and gourds. Have a great afternoon! They had pumpkins and gourds outdoors and indoors just inside the door. Love that place! Charlie is looking mighty spiff! I get a kick out of how she took to that cat tree,the one I bought the roomates for Christmas must be invisible, lol. Stealing your gourds idea,I love anything that doesn’t need to be stored. It took her a few hours to take to the cat tree. But now she loves it. I think all cats like to be up high. I told you she’d like to get up high! It’s an innate desire, like a bobcat, to sleep in safety or even to see what they can’t see from ground level in hunting prey. 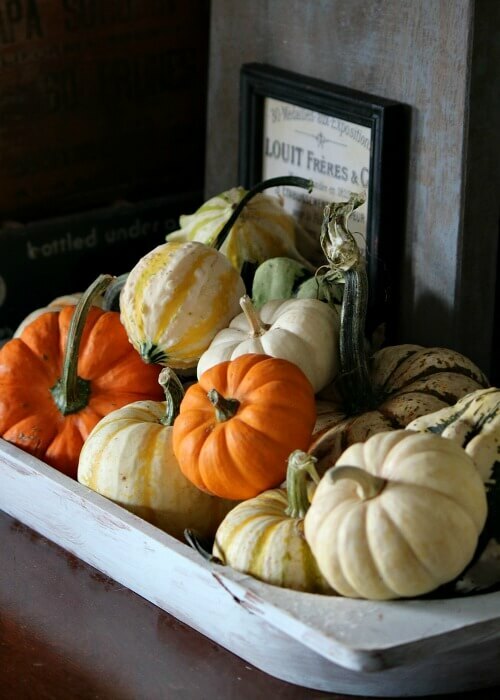 Love the seasonal look you have created with the pumpkins and gourds; planning a trip tomorrow up the beach to visit Trader Joe’s in order to purchase some of these pumpkins and gourds. I have never been into one of these stores so I am looking forward to the experience. Charlie looks quite handsome and Ivy looks quite content (for the moment). It’s a wonderful store. Their spices are $1.99 each, which is cheaper than Walmart. If you like ginger snaps, they are wonderful too. Best ones I’ve tasted since childhood. I will certainly purchase some ginger snaps; I cannot remember the last time I had a ginger snap! Less is better if you have no storage. I think those gourds look nice and decorative! Even if I make crafts to decorate with, I still have to store them. So I’m trying to go this route. Charlie boy looks very handsome. . . although not too pleased about having his picture taken! Ivy looks sweet on her perch. Wish we had a Trader Joe’s here! I really like your little gourds and pumpkins. I just put a fall/Thanksgiving wreath on my front door. I don’t want any indoor decor right now as I am working on my downsizing project. I will wait for Christmas….and can give away a lot of that when I get to it. I find that the older I get, the less I want to spend time with seasonal stuff. Your ideas for small spaces are great, though! He isn’t crazy about having his photo taken. Trader Joe’s finally came to Tulsa about two years ago. Now if we could just get IKEA to come to OK! Hi Brenda. Your decor looks very cozy and pretty. Maybe instead of buying the little gourds and pumpkins, you could save some seeds, or buy some in the spring, and plant some of these cute things on your patio. It would be fun to watch them grow during the summer. I’ve grown them before, and meant to this past year and forgot all about it. I went to Trader Joe’s recently, which was the first time in many months because we moved from the town that has the store. I was excited to get some old favorites, such as 21-Spice Salute no-salt seasoning, cookies shaped like maple leaves, and fall harvest salsa. Your hutch is so pretty with all your white dishes. Doesn’t look crowded at all & the gourds do give it a “fallish” touch. Wish we had a Trader Joe’s close by. I agree with your carrying this decorating over to Thanksgiving, it just makes it easier! Love your blog & your creative writing & decorating! Trader Joe’s has such good prices. They only came here about two years ago. Your place always looks perfect, Brenda! Looks like sweet Ivy has settled right in, I’m so glad you gave her a good home with you and handsome Charlie! Well, it’s far from perfect. And who would want perfect anyway. It’s lived in and has pets with all their stuff! *and you, too, little Charlie boy! Sorry about that. I wanted this post to be decorating primarily so it can be indexed in Google for someone looking for this type information. More pet photos tomorrow! I love how you decorate! I wish we had a Trader Joe’s and an Ikea here. We have to go to Atlanta for those, and believe me, Atlanta traffic is a nightmare! Charlie looks very handsome with his grooming and Ivy is beautiful! I don’t think your readers can get enough pictures of those two! The closest IKEA to all Oklahomans is Frisco, TX. Two years ago , after Thanksgiving, I threw all the miniature gourds and pumpkins into an empty spot in my flower bed. They came up and produced miniature gourds and pumpkins! I used them that Fall. We moved so I don’t know if they came up again or if it was just a one time thing. I was so excited that happened! Love all your flowers. WOW…. Soooo pretty !! Love the blue hutch decor and the white dishes !!!! Everything is so picture perfect !!!! Happy Fall !! It’s easier on me and no storing! I love your less is more decorating and all of the seasonal natural elements! Pretty perfect to me! It took me a long time to realize that less is often more. I was beginning to worry, no Ivy/Charlie photos, we need our Ivy/Charlie fix everyday, thank you! I have downsized from 3000 sq. ft. o 1000 sq. ft. so I really have no place to put seasonal decor. I always put up 4 trees inside and really went overboard, obviously, both inside and outside, and yes I know that is insane at my age but I love, love, love Christmas! In my new house I have absolutely no place for a tree, even a table tree. So for those of us who love to decorate for Christmas I would like to make a suggestion for some of your future blogs that maybe you could focus on small space decorating for the holidays. Pinterest makes my head swim. I find it to be very busy and cluttered, and I am probably the only one who feels that way, but it just doesn’t do it for me. I love seeing how you decorate in your space, and how you manage to change things around as much as you do. Everything always looks so nice. It amazes me how you have made space for Ivy’s scratching post and cat tree without things looking cluttered. I love the fall touches throughout your home! You did a great job with placement…they look so pretty! I will need to check out Trader Joe’s for the small white pumpkins. I haven’t seen any down where I live. Love the photos of Charlie and Ivy. Charlie looks slightly annoyed…LOL Love and hugs! The displays look lovely. Thank You for sharing. Your apartment always looks so “cozy”. Love your fall decorating ideas. We do not have a Trader Joe’s nearby. I live in a small town and there is not many stores to shop in. I have loads of pinecones in my yard, use them at Christmas time. So if you ever need cones let me know. Charlie is so handsome with his new trim and Ivy looks like she is ready to get into something??? They are both so adorable. Hi Brenda.Just a heads up on pine cones.We had a dog that suffered kidney damage from chewing pine sap off of her paw and she eventually died.Pine sap is very toxic. Wouldn’t want you to have any problems,I love the pictures and antics of your fur babies. My fall decorating has been minimal, too. The older I get, the less I do with decorating for the seasons. I bought some mini white pumpkins at TJ’s a few weeks ago and they all rotted within a week. I was so disappointed! That’s the first time that’s ever happened to me with mini pumpkins. I bought a few more (orange and white) from the local farm stand last week and so far, so good. They were only 5 cents more than the ones at TJ’s and I’d rather support a local farmer anyway, so it’s all good. Has Ivy found the pumpkins and gourds yet. 🙄. She sure is cute. It looks like Charlie needed her in his life. It’s so nice that they liked each other right away. Now Charlie has something to keep his mind and body busy. I think your not being ready for a new fur baby worked out just right. Someone knew that she was going to come along right when you were ready and saved her arrival (birth) at just the right time. That handsome Charlie boy! New hair cut looks good! And Ivy Lou looks like the queen of Sheba up there on her cat tree. She looks like she is really settling in. 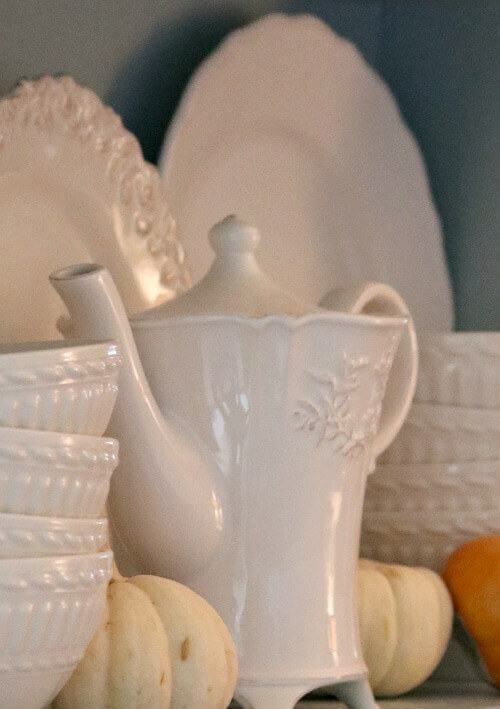 I love decorating with gourds and pumpkins. I like those little white pumpkins you can get now. I have little space for decorating and vignettes. I use my buffet in my tiny dining room as one place for decor and the top of my old up-right piano also. I can’t put too much decorative stuff up because I live with two rambunctious 7 -yr-old boys! There are a few places, like the end tables in my living room that I would use if it weren’t for their wild energy! But they’ll be grown all too soon, so I don’t mind waiting. Your Fall decorations look great. 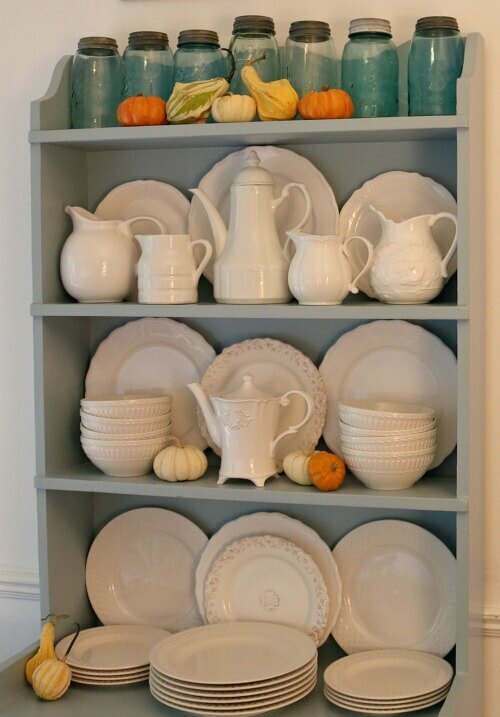 I especially like the top shelf on your blue cupboard with all the gourds and little pumpkins on it. Nice and simple. Sometimes I have trouble paring down the number of things I put in a display. I have to work on that. It’s just that I love ALL the little things that could go on display! Hope your week’s going well and you are enjoying your new dining table. Pats for the four-leggeds. Hi. I think your décor looks classy and cozy at the same time. 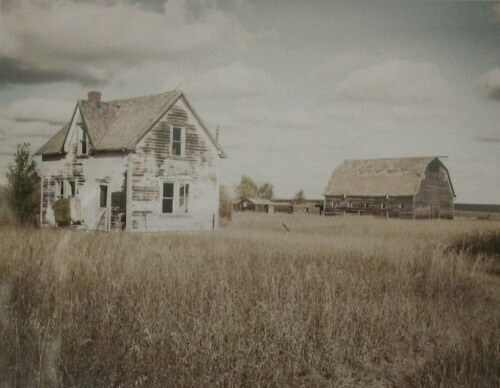 I think it’s because there are touches of black and white in with the more homey blues and earthy colors. Very nice! Someone mentioned putting the little gourds and pumpkins in the ground to see what springs up. I was about to suggest that you harvest the seeds and plant them when I read that suggestion, which sounds very clever — to just put the entire little pumpkin into the dirt. Should be interesting to see what happens. The furry duo is looking sharp today. The other day when you said Ivy now has the middle name of Lou, I said we hadn’t picked out a middle name for our cat Calvin. But my husband reminded me that his name is Calvin Calzone, because he is a bit chubby and shaped like an Italian calzone. I’m not so sure that I like that middle name and I bet Calvin doesn’t! But it is a word that aptly describes his shape. I think Charlie Ross and Ivy Lou have much nicer names! Have a nice day. The gourds look great, Brenda! We sure miss our TJ trips (we’ve moved). So many people around here want one, too, that we need to get organized and let Corporate know. I noticed in one photo that you have rosemary inside. I’ve never had success with overwintering it, but am determined to try yet again. Do you have any tips? Thanks!